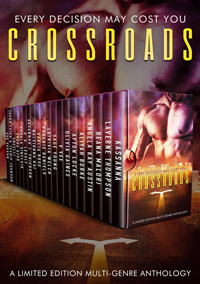 These stories run the gambit of the paranormal, other worlds, contemporary millionaires, military themed, alpha males, romantic suspense and even a touch of intrigue. There�s something for everyone and enough for all. 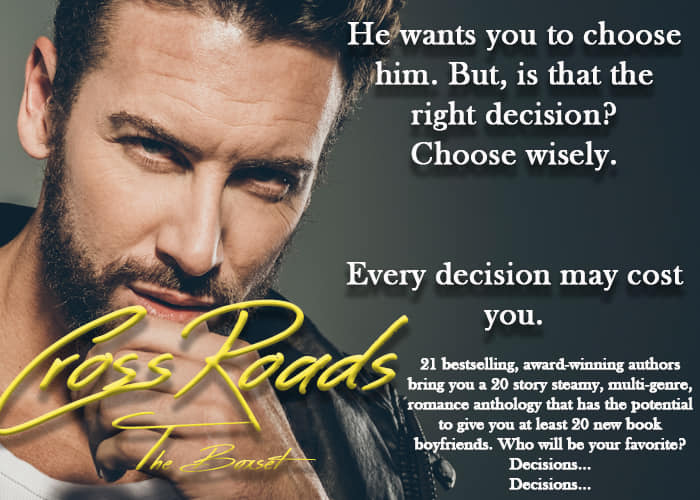 When Gina and Ryan meet at the crossroads, will they step across for love? The threat of death casts a shadow on their newfound love, but anything can happen at the crossroads�if they dare to step across. "What do you think you�re doing?" she asked. "I can at least load the dishwasher." She glanced at the living room. "After a big meal, you need to rest." "I told you, I want to be useful. It�s the least I can do." "Well, don�t wear yourself out. I don�t want to send you to your grave any earlier than necessary." The remark hit him like a sucker punch. Because, during the entire meal, he�d actually forgotten he was about to die. She gripped his shoulder, regret flashing in her eyes. "Ryan, I�m sorry. My mouth runs away from me sometimes." "Well, maybe we should keep it occupied." Before he could stop himself, he gripped her chin between thumb and forefinger and pressed his lips to hers. After the quick contact, they stared at each other. Her lips remained parted, making his groin stir to life. The shock in her eyes, sharp and bright, grew hazy�with desire. He kissed her again, drinking deeply from her beautiful mouth. As if she were the only medicine on earth that could save his life. "What are we doing?" she whispered, brushing her fingers across her damp lips. "This is completely inappropriate." He shrugged as he tried to catch his breath. "We�re not breaking any rules, are we?" "Well, a kiss like that is going to break something."